Post-apocalyptic Librarian: Because I am the Nerd-brarian! Because I am the Nerd-brarian! I've been wondering for a long time how to start this blog, and what I could possibly have to say. But as a nerd and a browncoat this is something I cannot help but post! Yes. That is the Serenity book! And if you were wondering, no, I am not the only person to have got this out of my library! 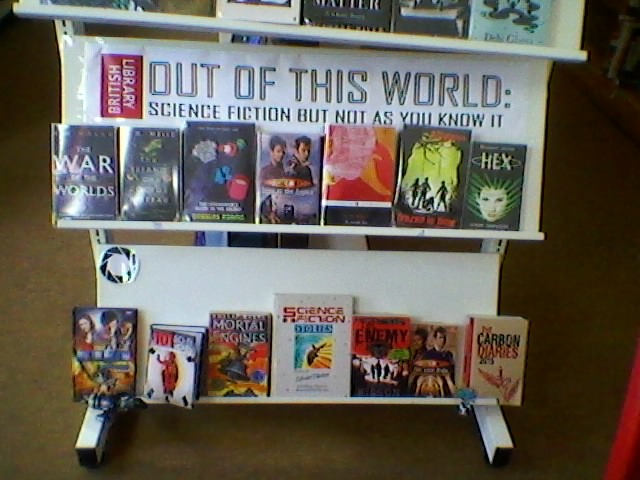 I admit its probably not one of the best displays I've done, rushed off out of desperation to fill a gap advertising a long gone library event, but given the opertuinty how could I not promote the BL's new Sci-fi exibition! Check it out for yourself here. The official line is I'm promoting reading outside of school, holidays coming up and all, and getting involved in the local area (we're a london school); unoffical line? I need a large picture of Nathan Fillion hanging up in my library :). So for now we're Still Alive, ;) and hopefully this'll be my starter for ten for some more throughtful web posts.